Most yogis will tell you they practice on their mats for a wide variety of benefits, but that weight loss isn’t really one of them. Which is why making Yoga Cookies isn’t completely counterintuitive (like making Weight Watchers cookies would be). The hand crafted tin cutters come in sets of five and are available in two themes: lotus and downward dog. 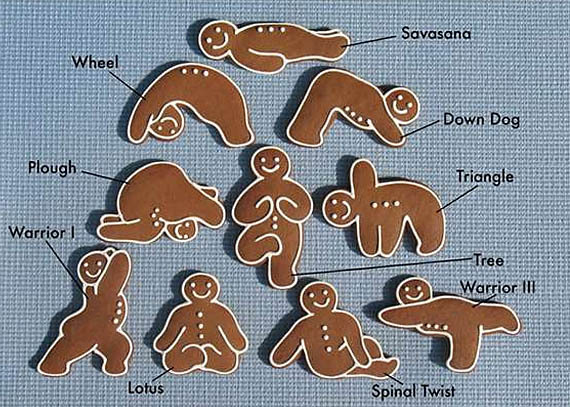 A gingerbread recipe is included to get you started on the path towards baking cookies that will knock your chakra off. The Hairdo Cookie Cutter Lets You Change A Cookie's Hairstyle! Now You Can Buy A Cookie Cutter Shaped Like Your Face!